Dramatis Personae: A collection of every named person so far in the thread, for the reference of those involved. Party Treasure: The still-unclaimed treasure from past excursions, for people to grab as necessary before excursions. After talking with Shaun, I've decided: A monk's unarmed strike becomes masterwork at 4th level. Just letting folks know that I'm pretty happy with the level of activity as of late, so thanks to you all! Once things look to be fairly well-resolved CI-wise and things start to slow, I'll move things ahead to the next set of adventures, but the thread's going pretty well right now, so I'll go ahead and let you all continue on this until you feel ready to move on. Two updates, one in three parts. 1) I've added a page to collect the house rules and other related things for Planescape in one place, for the convenience of myself and the players. This page can be found here: http://mysidia.org/Planescape/pwRules.html I will edit this into the first post of the thread (along with the NPC list and party treasure pages) so it can be easily found in the future. 2) As you can see on that page, I've made some modifications to some spells based on Cook's Book of Experimental Might. Arcane Lock now merely provides a +10 bonus to the target's Disable Device DC to open its lock, in addition to the +10 bonus to its DC to break it open. Bear's Endurance, Bull's Strength, Cat's Grace, Eagle's Splendor, Fox's Cunning, and Owl's Wisdom are reverted to their 3.0 incarnations: all have their bonuses changed to 1d4+1, and their durations increased to 1 hour/level. Knock, rather than automatically opening a lock, instead allows the caster to make a caster level check (modified by the caster's relevant ability mod) vs. the DC of the lock to open it. Instituting a new rule, based on an idea I've been tossing around in my head the last day or two, inspired by this concept. Basically, I'm going to be rewarding you all for coming up with elements of the campaign, either for your own personal plots or for the campaign as a whole. As you play the game, you can have your PC "discover" something or someone during the game, providing whatever behind-the-scenes details you come up with to me OOCly if necessary. This could be a merchant or guide, it could be an overheard rumor, it could be an adventure based on a part of your character's background or personal plot, anything that would normally be considered DM-only territory. For a fitting NPC concept or a one-line plot hook, you will get 5% of the total XP needed to reach your next level. For a fully-statted NPC, or a fleshed-out plot hook of a paragraph or two, you'll get 10%. For a fully-designed scenario, you'll get 20%. Other elements will be rewarded along similar lines relative to the amount of work put in. Within reason, of course - while I encourage you to submit ideas, you won't be able to gain more than half of the total XP to next level through this method in any given level. And in the case of scenarios, ideas that will be able to involve a full party will be preferred, even for those scenarios relating to a character's specific interests. While I don't mind side-sessions by any means, it's more fun if you can get multiple people involved. Also preferred will be ideas that can easily fit into the setting, but that's less of a concern. Most any scenario you could come up with, I'm sure I could fit in somewhere. 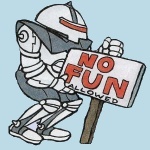 Also, everyone should keep in mind that if this gets to be popular enough, I may not be able to use everyone's ideas, but I will do my best to do so, interweaving multiple people's ideas if necessary. With the final version of Pathfinder now out, pretty soon here I'm going to be converting folks over from the Beta. Though I don't expect there to be any especially major changes, and more than likely no negative ones, I'll be sure and let people know of any changes in either direction I find. For those inclined to work their way through for themselves, it looks like there's a srd up. While I was working on the maps for the trap contest, I thought it'd be nice to provide a map reference for those that can detect magic. So I'm going to be doing something new with maps now for that. If there are people with detect magic active, I'll be including a second map representing auras as well, stuck in a spoiler for only such people. 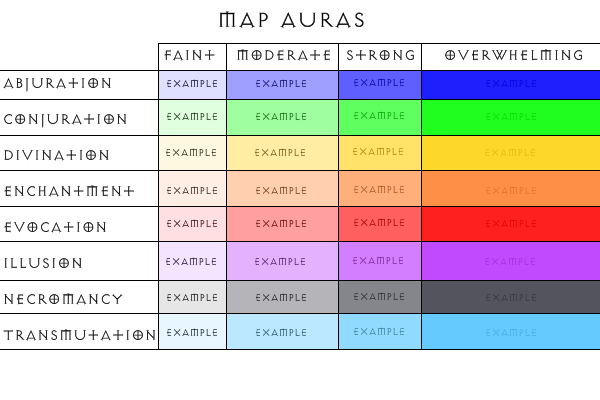 Here's the chart of what colors/transparencies will represent what auras. This won't replace my just saying what you detect, this is just so you don't need to keep flipping back to check, and so you can see exactly where a given aura is. Hay Christian. Idran suggested to me that Magpie would probably have explained to Lorraine about his day at court, and linked me to the log of that event. Do you wanna jump into CI from there, or would Magpie possibly leave some important details out? Hmm. It's possible it did, so we could have a go at that anytime that's fine with you (and, I imagine, Idran). I meant in the thread, actually, but I wanted to be sure what information Lorraine would have. See you in the RP! When you activate a ring of the four winds, it creates gusts of wind that grant you a +2 deflection bonus to AC against a single attack. Alternatively, you can activate it to use a feather fall effect on yourself. This ring functions a total of four times per day. You can activate a spellsink scarab whenever you would take hit point damage from a spell or psionic power. A scarab has 3 charges, which are renewed each day at dawn. Spending 1 or more charges reduces the damage dealt to you by the spell or power (to a minimum of 0 points of damage). 1 charge: Reduce damage by 2d6 points. 2 charges: Reduce damage by 3d6 points. 3 charges: Reduce damage by 4d6 points. Go ahead and make your item claims in this thread. All right, two changes. First off, the Profession skill is now officially removed from my game. If you want benefits from something like it, you can essentially just take it for free as part of your background; if it's reasonable for you to be able to do something Profession-y, you can, no skill points required. The second, and much larger: I mentioned in Other Journies that I was going to be tweaking the Fighter class to make it more interesting, and give it a bit more to help it keep up. This isn't a complete fix, and more may come in the future, but for now this is what the Fighter class will look like in Planewalkers. This change will apply to everyone with Fighter levels, and anyone with levels in Fighter that wishes to reselect skills or feats with the new changes is free to do so. Credit goes to The Gaming Den for the majority of the changes. Alignment: Every alignment has its share of Fighters, however more Fighters are of Lawful alignment than of Chaotic Alignment. Races: Every humanoid race has warriors, but actual Fighters are rarer in societies that don't value logistics and planning. So while there are many Fighters among the Hobgoblins, Dwarves, and Fire Giants, a Fighter is rarely seen among the ranks of the Orcs, Gnomes, or Ogres. Class Skills: The Fighter's class skills (and the key ability for each skill) are Acrobatics (Dex), Bluff (Cha), Climb (Str), Craft (Int), Diplomacy (Cha), Escape Artist (Dex), Handle Animal (Cha), Intimidate (Cha), Knowledge (all skills individually) (Int), Perception (Wis) Ride (Dex), Sense Motive (Wis), Stealth (Dex), Survival (Wis), and Swim (Str). Weapon and Armor Proficiency: Fighters are proficient with all simple and Martial Weapons. Fighters are proficient with Light, Medium, and Heavy Armor and with Shields and Great Shields. Weapons Experience (Ex): Fighters train obsessively with armor and weapons of all kinds, and using a new weapon is easy and fun. By practicing with a weapon he is not proficient with for a day, a Fighter may permanently gain proficiency with that weapon by succeeding at an Intelligence check DC 10 (you may not take 10 on this check). Combat Focus (Ex): A Fighter is at his best when the chips are down and everything is going to Baator in a handbasket. When the world is on fire, a Fighter keeps his head better than anyone. If the Fighter is in a situation that is stressful and/or dangerous enough that he would normally be unable to "take 10" on skill checks, he may spend a Swift Action to gain Combat Focus. A Fighter may end his Combat Focus at any time to reroll any die roll he makes, and if not used it ends on its own after a number of rounds equal to his Base Attack Bonus. Armor Training (Ex): Starting at 3rd level, a Fighter learns to be more maneuverable while wearing armor. Whenever he is wearing armor, he reduces the armor check penalty by 1 (to a minimum of 0) and increases the maximum Dexterity bonus allowed by his armor by 1. Every four levels thereafter (7th, 11th, and 15th), these bonuses increase by +1 each time, to a maximum –4 reduction of the armor check penalty and a +4 increase of the maximum Dexterity bonus allowed. In addition, a fighter can also move at his normal speed while wearing medium armor. At 7th level, a fighter can move at his normal speed while wearing heavy armor. Problem Solver (Ex): A Fighter of 3rd level can draw upon his intense and diverse training to respond to almost any situation. As a Swift action, he may choose any [Combat] feat he meets the prerequisites for and use it for a number of rounds equal to his base attack bonus. This ability may be used once per hour. Pack Mule (Ex): Fighters are used to long journeys with a heavy pack and the use of a wide variety of weaponry and equipment. A 3rd level Fighter suffers no penalties for carrying a medium load, and may retrieve stored items from his person without provoking an attack of opportunity. Active Assault (Ex): A 5th level Fighter can flawlessly place himself where he is most needed in combat. He may take a 5 foot step as an immediate action. This is in addition to any other movement he takes during his turn, even another 5 foot step. Weapon Training (Ex): Starting at 5th level, a fighter can select one group of weapons, as noted below. Whenever he attacks with a weapon from this group, he gains a +1 bonus on attack and damage rolls. Further, should the fighter possess any weapon-specific feats for a weapon in this group, it applies to all weapons in the group. Every four levels thereafter (9th, 13th, and 17th), a fighter becomes further trained in another group of weapons. He gains a +1 bonus on attack and damage rolls when using a weapon from this group. In addition, the bonuses granted by previous weapon groups increase by +1 each. For example, when a fighter reaches 9th level, he receives a +1 bonus on attack and damage rolls with one weapon group and a +2 bonus on attack and damage rolls with the weapon group selected at 5th level. Bonuses granted from overlapping groups do not stack. Take the highest bonus granted for a weapon if it resides in two or more groups. A fighter also adds this bonus to any combat maneuver checks made with weapons from this group. This bonus also applies to the fighter’s Combat Maneuver Defense when defending against disarm and sunder attempts made against weapons from this group. Forge Lore: A 7th level Fighter can produce magical weapons and equipment as if he had a Caster Level equal to his ranks in Craft. Improved Delay (Ex): A Fighter of 7th level may delay his action in one round without compromising his Initiative in the next round. In addition, a Fighter may interrupt another action with his delayed action like it was a readied action (though he does not have to announce his intentions before hand). Foil Action (Ex): A 9th level Fighter may attempt to monkeywrench any action an opponent is taking. The Fighter may throw sand into a beholder's eye, bat aside a key spell component, or strike a weapon hand with a thrown object, but the result is the same: the opponent's action is wasted, and any spell slots, limited ability uses, or the like used to power it are expended. A Fighter must be within 30 feet of his opponent to use this ability, and must hit with a touch attack or ranged touch attack. On a successful attack, the target must succeed on a reflex save of DC 10 + the fighter's class levels or the action is lost. Using Foil Action is an Immediate action. A Fighter may not wait until an action is partially completed before deciding to attempt to foil the action, but must instead attempt to foil an action as it is declared. Note that this means that a Fighter may not foil a Full Attack (because it is not declared until after it has already begun), nor may he foil a move or charge action that began out of range. At 17th level, Foil Action may be used at up to 60 feet. Lunging Attacks (Ex): The battlefield is an extremely dangerous place, and 11th level Fighters are expected to hold off Elder Elementals, Hezrous, and Hamatulas. Fighters of this level may add 5 feet to the reach of any of their weapons. Array of Stunts (Ex): A 13th level Fighter may take one extra Immediate Action between his turns without sacrificing a Swift action during his next turn. Greater Combat Focus (Ex): At 15th level, a Fighter may voluntarily expend his Combat Focus as a non-action to suppress any status effect or ongoing spell effect on himself for his Base Attack Bonus in rounds. Armor Mastery (Ex): At 19th level, a fighter gains DR 10/— whenever he is wearing armor or using a shield. Intense Focus (Ex): A 19th level Fighter may take an extra Swift Action each round (in addition to the extra Immediate Action he can take from Array of Stunts). Supreme Combat Focus (Ex): A 19th level Fighter may expend his Combat Focus as a non-action to take 20 on any die roll. He must elect to use Supreme Combat Focus before rolling the die. Weapon Mastery (Ex): At 20th level, a fighter chooses one weapon, such as the longsword, greataxe, or longbow. Any attacks made with that weapon automatically confirm all critical threats and have their damage multiplier increased by 1 (×2 becomes ×3, for example). In addition, he cannot be disarmed while wielding a weapon of this type. Okay, I think Rosalyn will be wanting the Spellsink Scarab, since nobody's claimed it yet. You gain a temporary respite from the natural effects of a specific plane. These effects include extremes in temperature, lack of air, poisonous fumes, emanations of positive or negative energy, or other attributes of the plane itself. In addition, some effects specific to a plane are negates by avoid planar effects. In the D&D cosmology, avoid planar effects negates the deafening effect of Pandemonium and the cold damage on the Cania layer of the Nine Hells. The effects of gravity traits, alignment traits, and magic traits aren't negated by avoid planar effects, nor is the special entrapping trait that some planes (such as Elysium and Hades) have. The spell does not provide protection against creatures, native or otherwise, nor does it protect against spells, special abilities, or extreme and nonnatural formations within the plane. This spell allows you to survive on the Elemental Plane of Earth, but it won't protect you if you walk into a pool of magma on that same plane. This mask fits over the character's nose and mouth. The bulk of the item is a cloth packet holding a porous, spongelike substance. It requires a move action to put on or remove, and once a single breath is taken through the mask, its benefits last for only 1 hour (or less if taken underwater). A creature wearing an auran mask receives a +5 circumstance bonus on Fortitude saves against inhaled toxins. In addition, the wearer can breathe underwater as if under the effect of a water breathing spell, though immersing the auran mask in water reduces its remaining duration to 10 minutes (or less, if less than 10 minutes remain). New system I'm going to be incorporating into Planewalkers! Plot twist cards, a kinda-popular homebrew mechanic that Paizo recently printed up into a solid set of things. Essentially, they're a way to give players a bit of control on the plot of a game, and influence how things unfold. Here's how they work. Everyone in the game, both threads, will get one card to start. Each card has a specific theme, and will have two possible uses. First, it will have a mechanical effect listed. You don't need to describe how the mechanical effect takes hold (though you can), all you need to do is say who and how you're using it. Second, and more interesting; you can use the card to describe any possible event or happenstance that falls under the purview of the theme. Each card will have a few examples of ways you could apply it, but anything that fits the idea is acceptable. I can either accept your plot twist, modify it but keep the general idea, or reject it, but if I reject it, you get a replacement card. Each player will start with one card. You'll get a new card at the end of each adventure. You'll also get a new card if you play a card in what I (or the players) think is an especially fitting, dramatic, or fun way. And each adventure MVP will get a bonus card for winning the vote. Also, playing a card shouldn't be a big secret or anything unless there's a really good reason for it - the players deserve to take credit for stuff, especially if it turns out really well. Now, here's the cards everyone will get to start with, I randomly drew them here for you all just now. People can trade if they want, just keep things one-for-one. Where'd that tentacle come from? With the Pathfinder Advanced Player's guide having been released, I decided to put together new equipment pages that combine all the lists from that, the core, and Adventurer's Armory. You can find the results here. If anyone wants to update or replace any equipment based on this stuff, go ahead; since this is a new resource you didn't have OOC when the current adventures started, I'm fine with retconning in some of this stuff for your characters. Since I haven't taken care of it yet, here's the list of equipment recovered from the frozen bodies in the clockwork base, after Asp's identification. handy haversack filled to the brim with rations, clothing, and other various traveling supplies plus two potions of resist energy and a wand of magic weapon. DarkLordKelne (11:16:18 PM): [...]you just know Asp's claiming the haversack if nothing else. DarkLordKelne (11:16:36 PM): Because c'mon, infinite backpack. Idran1701 (11:19:01 PM): Contents too? DarkLordKelne (11:22:10 PM): Sure, why not? Though a fair amount of the rations and such would be turfed out to make room for trinkets. In fact, a good chunk would probably be donated to the villagers if they were still in need. DarkLordKelne (11:23:44 PM): Also, Asp is not above nabbing the ioun torch (niftiest light source ever) and third eye of improvisation. Edit: To clarify, Asp isn't claiming the potions in the haversack. And he's only claiming the wand if no one else does, since he can use it. And don't forget, folks can trade them amongst one another too if you'd like. Kongunvir will be taking the Ring of Feather Fall and, if he gets a second pick, the Campfire Bead. Magpie is all up in that Third eye thingamajig! Flaming: On command, weapon becomes covered in flames that give +1d6 fire damage. +1d6 damage to constructs for any weapon it's attached to. Constant endure elements effect, plus it can give cold and fire resistance for one round at a time. 3 charges a day, 1 charge: resistance 10; 2 charges: 15; 3 charges: 20. Magpie still has a second pick, and Lorraine and Shawn can pick from these still too. Azerbrass: An alloy whose creation is little known to those other than the azer, due to steps in its creation that must be performed within the plane of Fire, this material acts as mithral in addition to providing the equivalent of a constant endure elements (60-250 degrees Fahrenheit). I forgot this loot stuff was here. I since it's all still sitting there, Lorraine will snag the +1 Flaming Greatsword and the Amulet. Just realized I never drew a plot card for Angelica when she came in. Here's yours, Angelica; rules on how they work are a few posts up. Oh, and don't forget that just because I'm on hiatus, if anyone wants to post CI-type stuff in the thread, feel free! I'll just put my name down to return whenever an opening arises.